Unser Team erreichen Sie täglich von 7.00 Uhr bis 18.00 Uhr. Wir bitten Sie, Ihre Samenbestellung bis 10.00 Uhr aufzugeben. Wenn Sie über das unten stehende Online-Bestellformular bestellen, erhalten Sie umgehend eine Bestätigung an Ihre angegebene E-Mail-Adresse. Bitte kontaktieren Sie uns, wenn Sie keine Nachricht erhalten haben. A picture-perfect sire and athlete. Levisonn has everything you could wish for in a stallion: type, charisma, great movements, a fantastic pedigree and a very high performance potential. Levisonn passed his 30-days-test in Redefin with superior marks (total 8.93) in jumping (9.28) and dressage (8.26). The beautiful grey stallion confirmed these expectations during the 70-days-test, where he won the test by more than 20 points - with a total of 141.15. Once more, Levisonn demonstrated his combined talent for jumping and dressage by getting the highest scores in both dressage (139.57) and jumping (130.19). Levisonn was presented in youngster classes (jumping) as a 5- and 6-year-old and achieved several victories and placements. He was competing in 1.40 m classes before he retired due to an injury. Levisonn is now at stud only. His sire Levisto is deemed to be the international figurehead of the Studbook Zangersheide (Belgium). In 2008 and 2009, he was "Sire of the World" and winner of plenty international Grand Prixs while being ridden by Judy-Ann Melchior. Levisto’s dam, Hirtin (alias Chica Bay), was also an internationally successful show jumper and is the sister of Clinton I and II. Dam sire Lennon was a stallion of the Holstein Association. 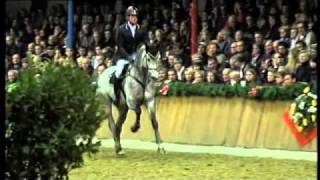 Although he was used for breeding for only a very short time, he produced several jumping horses successful up to 1.50 m.
Grand dam Narwan produced 18 successful horses in 18 years, including the licensed stallion Rouletto, multiple show jumpers who were successful in the highest classes (Carwan, Baldessarini) and numerous highly competitive dressage horses (Romino). Levisonn is, like Lordanos, out of the Holstein dam line 776, which is known for extraordinary inheritance of performance. It is the most successful Holstein dam line in the world. You want to know more about Levisonn?